A 6-member research team from Justus Liebig University, Germany, was hosted by the Department of English when they visited Sri Lanka to collect speech data for the International Corpus of English – Sri Lanka (ICE-SL). ICE-SL is a part of the larger International Corpus of English project begun in the early 1990s, and is the only corpus of Sri Lankan English anywhere in the world. The project is a research collaboration between the Departments of English of the two universities, and aims to compile a one- million-word corpus of written and spoken Sri Lankan English which can be used for research into distinctive features of English as it is used in Sri Lanka. 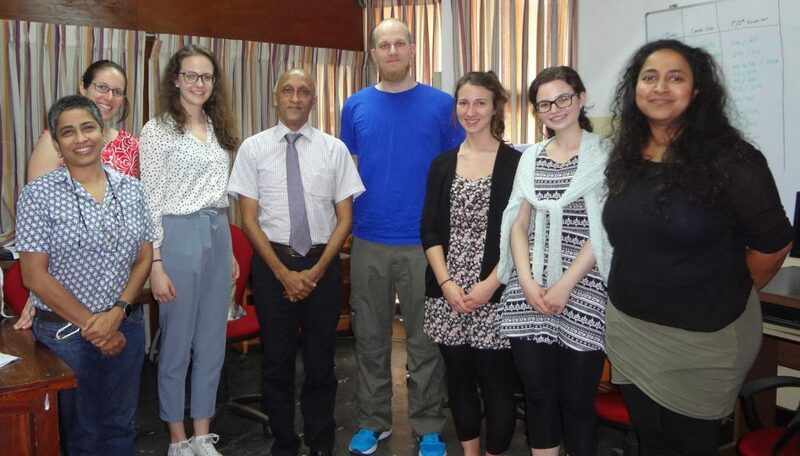 A seven member team from the Institut fur Anglistik, Justus Liebig University Giessen, Germany will be in Sri Lanka from 25 July – 11 August, 2015on a linguistic fieldwork excursion. The excursion is a part of the International Corpus of English – Sri Lanka (ICE-SL), a collaborative research project between the University of Giessen and the Department of English, University of Colombo. The corpus of Sri Lankan English which is being compiled under this project is a linguistic database which will contribute towards the study of how varieties of English develop across the world. Based at the Department of English, University of Colombo, the excursion team will collect recordings of Sri Lankan English spoken at various events (face to face conversations between friends and family, classroom lessons and demonstrations, talks, news, sports commentary, discussions broadcast on radio and television, etc.). The team comprises of Dilini Algama, a former student of the Department of English, University of Colombo, who is the Coordinator of the ICE-SL project, and six students of the University of Giessen.